Often referred to as the Comet, the Marine Betta is a stunning member of the Plesiopidae family. It’s a easy going and hardy fish, well suited for the beginner as long as certain requirements are met. The Marine Betta can get quite large; up to 8 inches. It needs a tank of at least 50 gallons with live rock and hiding places. It can also be moderately difficult to get eating. Live feeder shrimp have been known to generate a feeding response. Once the Marine Betta settles in, it’s one of the easier colorful species of marine fish in the hobby. Although the Marine Betta will leave coral and anemones alone, it will consume smaller fish and small crabs and shrimp. Proper tank mate research is prudent as any ornamental shrimp or small fish will be eaten without hesitation. This Grouper also does not like bright light. Proper shelter is necessary for refuge purposes. Most specimens are more active at dusk. This species is not finicky with water parameters. 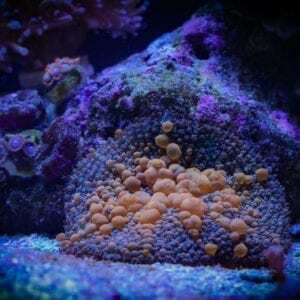 Basic reef parameters will suffice; temp. 72-78 degrees, SG 1.023-1.025, PH 8.1-8.4, dKH 8-12, nitrates <10ppm, nitrites and ammonia 0 ppm.